Ever tried barbequing for breakfast? Give it a go with this delicious breakfast sandwich! 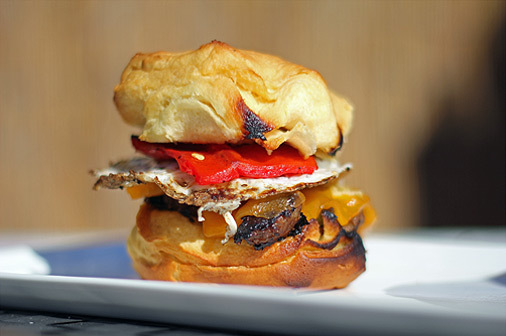 Simple breakfast sandwich with country sausage, eggs, cheese and roasted red peppers on a biscuit. .
Use Island Grillstone, skillet or griddle; preheat. Sauté white onions, green onions and garlic. Place red bell peppers in plastic bag to steam, 10 minutes. Peal skin off red bell peppers; set aside. Mix sausage, onion mixture and Cholula sauce. Form into patties about 3-4 inches across.